Graphic: Dimensional Fund Advisors. Past performance is no guarantee of future results. Academic research has identified key factors which point to differences in expected returns over the long term. In a factor-based approach, capturing such differences does not involve predicting which stocks, bonds, or market areas are going to outperform in the future. Rather, the goal is to hold well-diversified portfolios that emphasize the attributes of higher expected returns. This is done by overweighting or underweighting securities (companies) compared to their market weight. 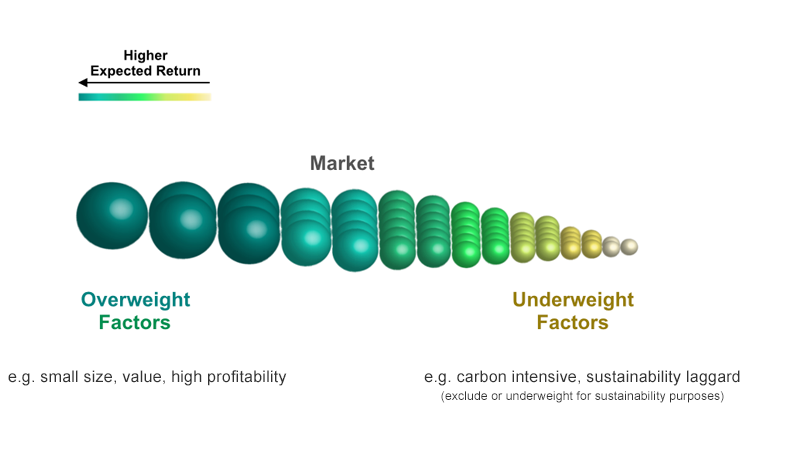 As an additional dimension, sustainability-oriented factor strategies overweight, underweight or exclude companies based on their carbon-intensity and sustainability scores.